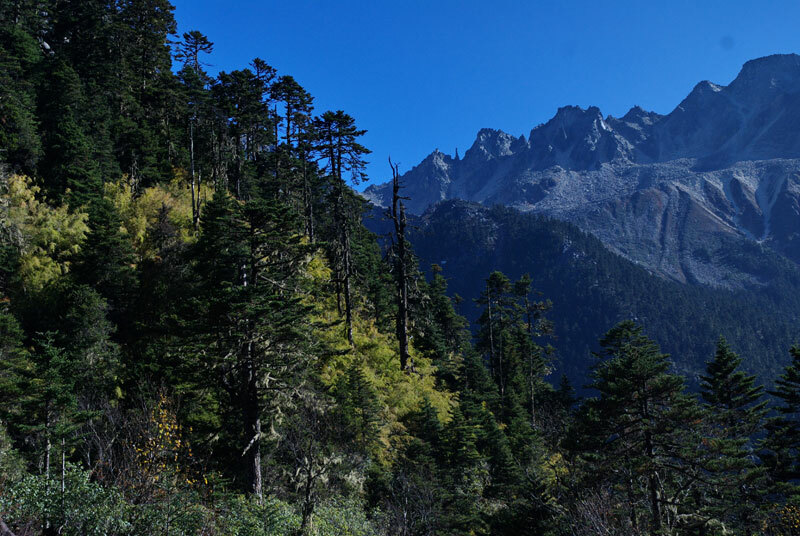 Blue sky, high mountains and forests. 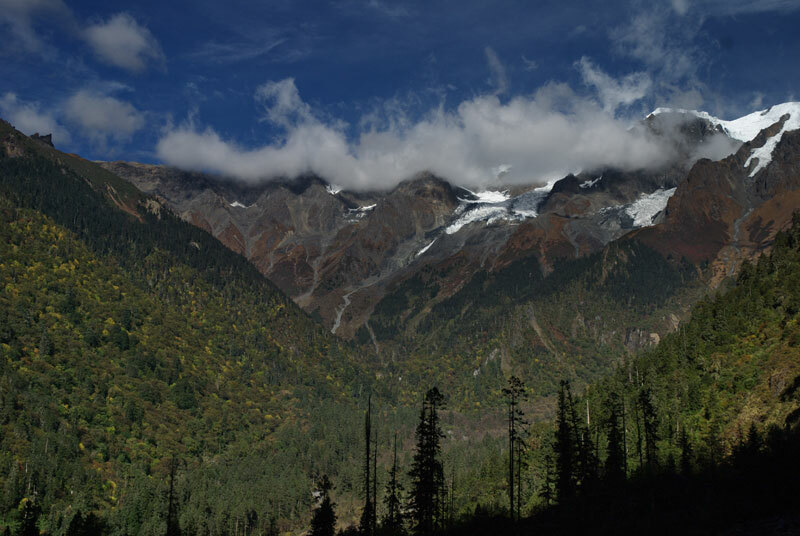 View of Kawa Karpo with fine clouds. 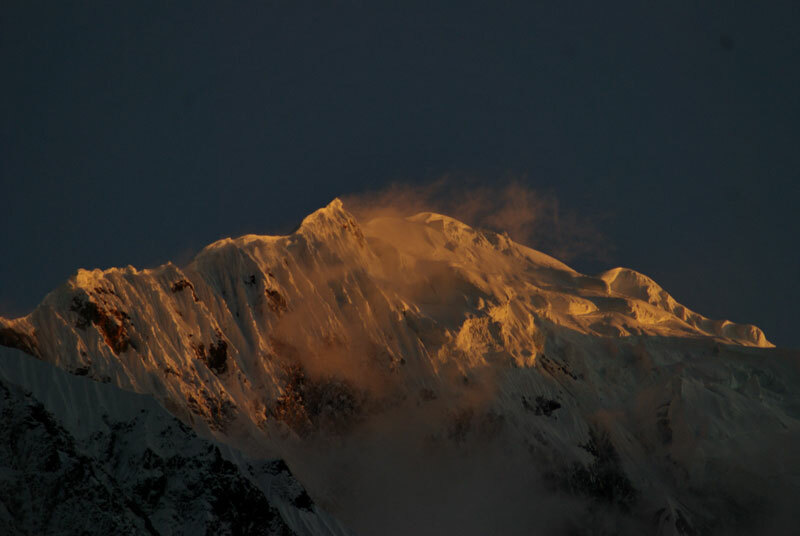 Sunrise at Kawa Karpo summit, as seen from SE. Steiler Pfad hinab vom Duoka La (4471m). 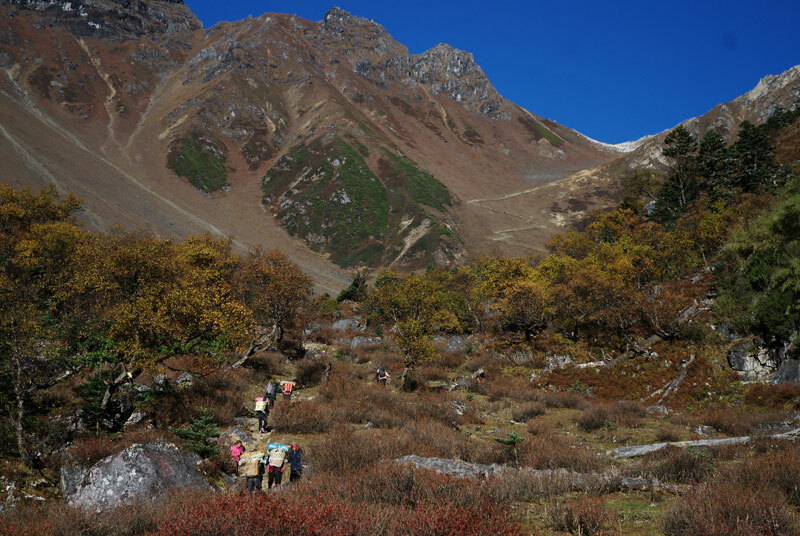 Fall season is an ideal time for hiking the Kora around Kawa Karpo. The high passes are free of snow and the air is clear. The deciduous forest are amazingly colorful. 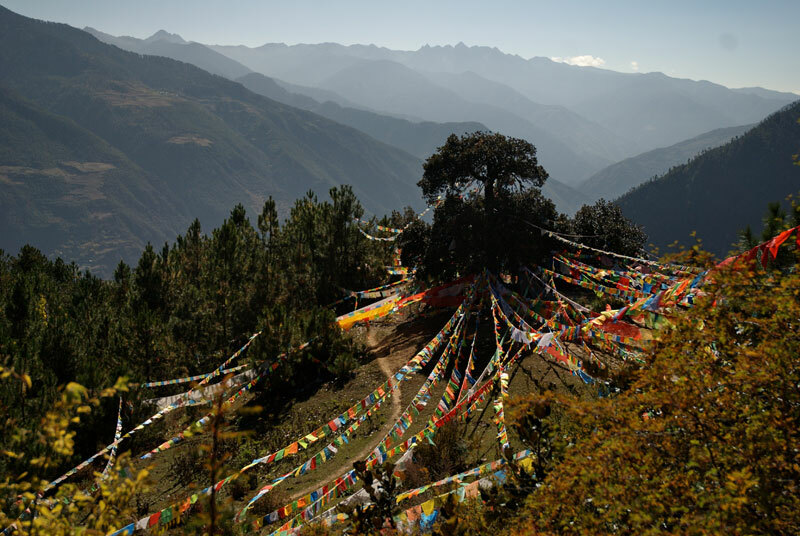 In late September, when harvests have been done, the local Tibetans have time for pilgrimage. 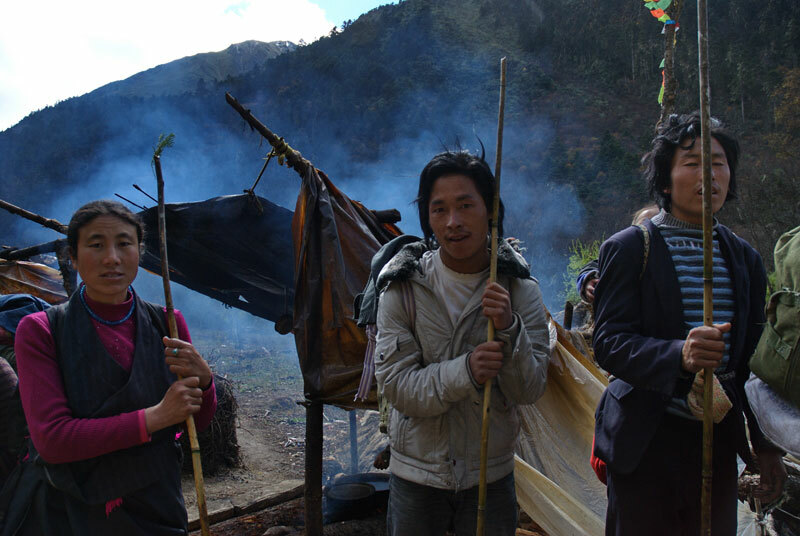 At this time one can see whole families, including grandparents and babies on the pilgrimage trek. 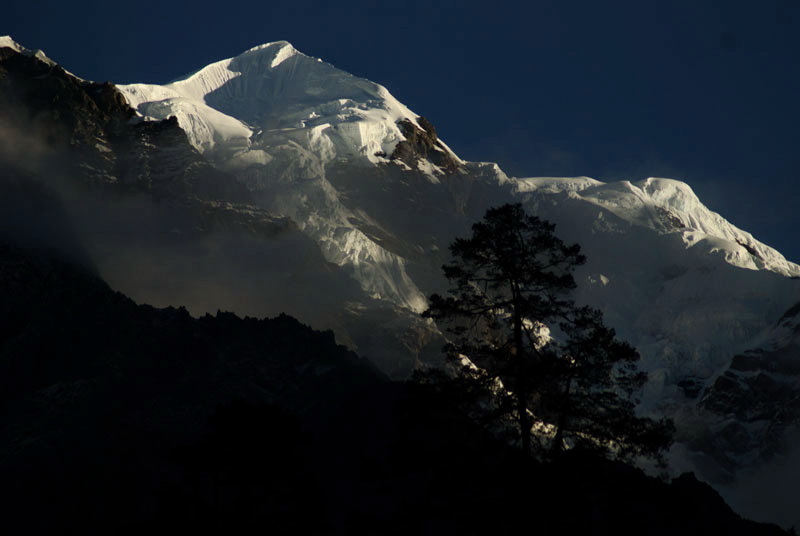 From far away you can hear their cheerful singing as they walk down the steep Duoka La. Curious views at the tent. 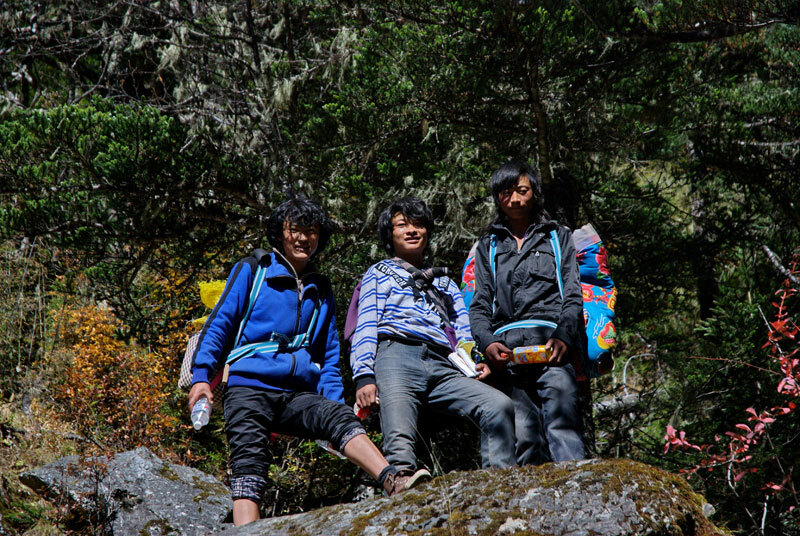 Pilgrims on their way up to Duoka La. Autumn colors. On descent from Duoka La. 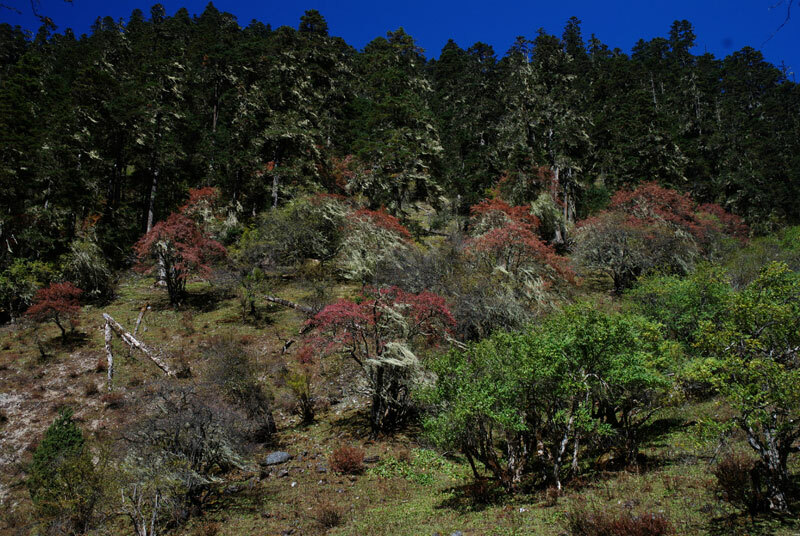 Red colored leaves, white lichens and fir trees. 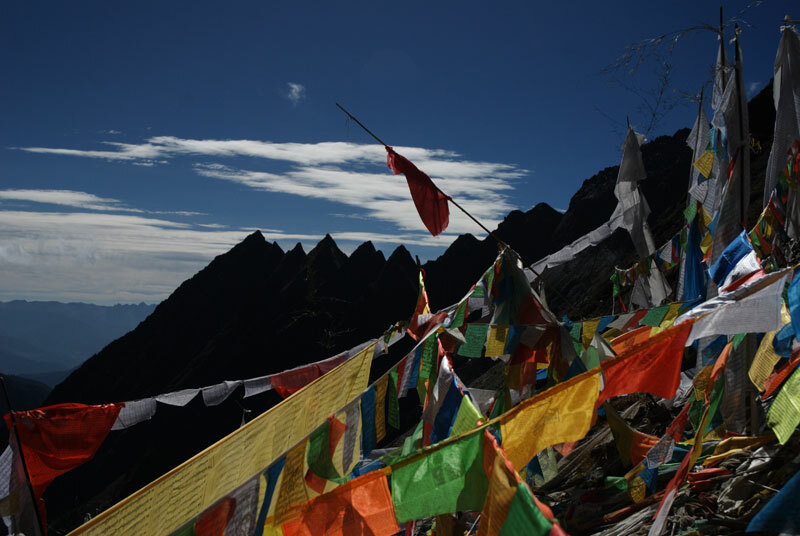 Prayer flags on the Duoka La (4471m). 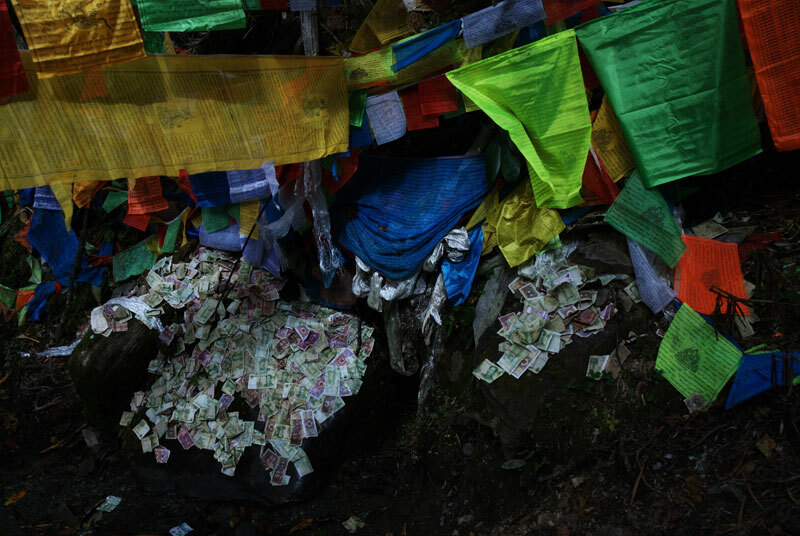 A holy spring decorated with money. 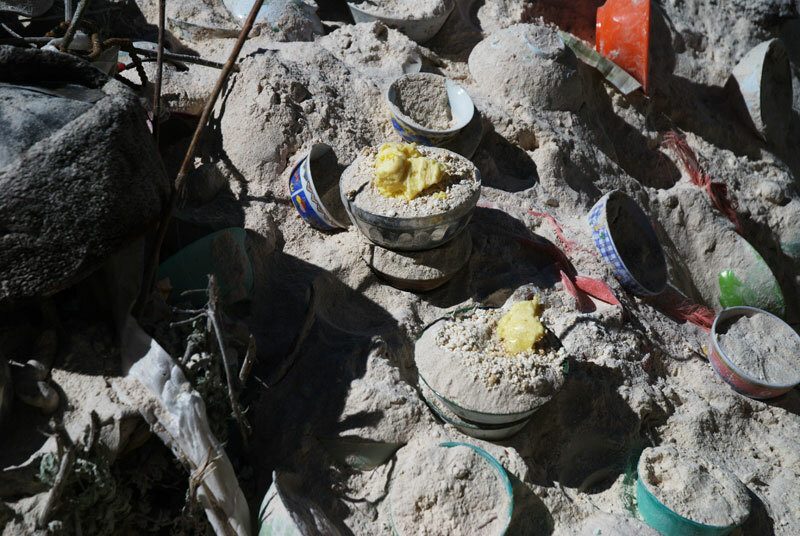 Tsampa and butter is left for the gods on a pass. 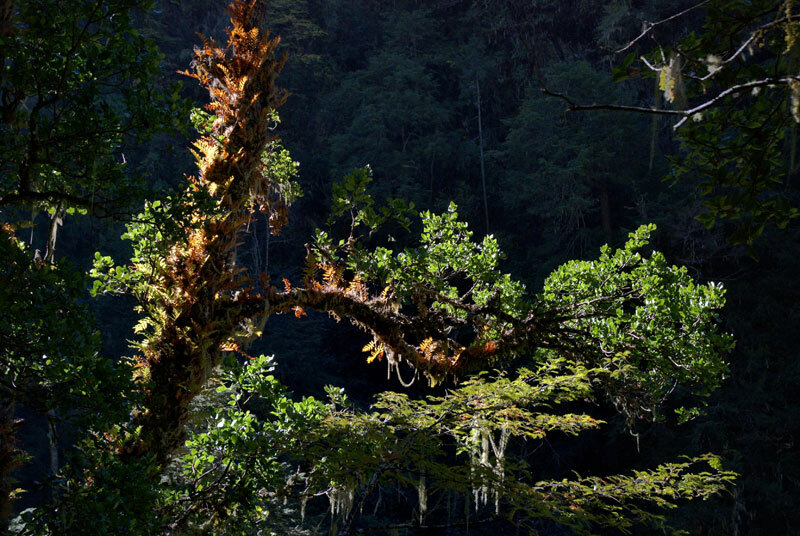 Oak tree with epiphytic ferns and lichens. Autumn colors: the diversity of trees becomes apparent. The vegetation zones on the mountain slopes. 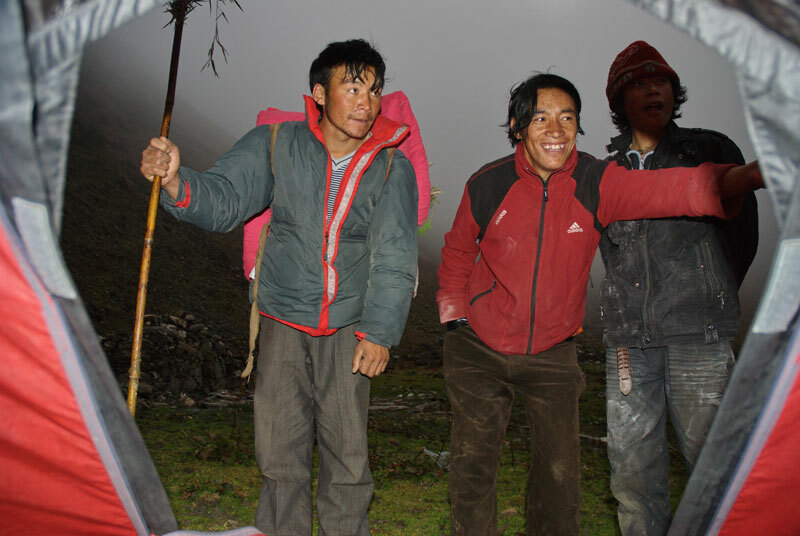 Pilgrims on Duoka La in early morning. Fir trees and bamboo as understorey. 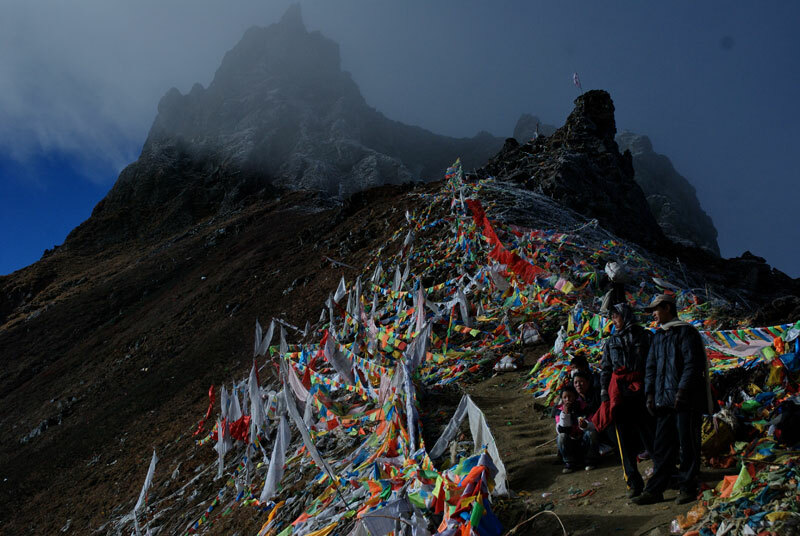 Prayer flags are to be found on any kind of pass. When is the best time to do the Kora? In spring one can experience the unique richness and diversity of Rhododendron flowering and blooming alpine meadows. 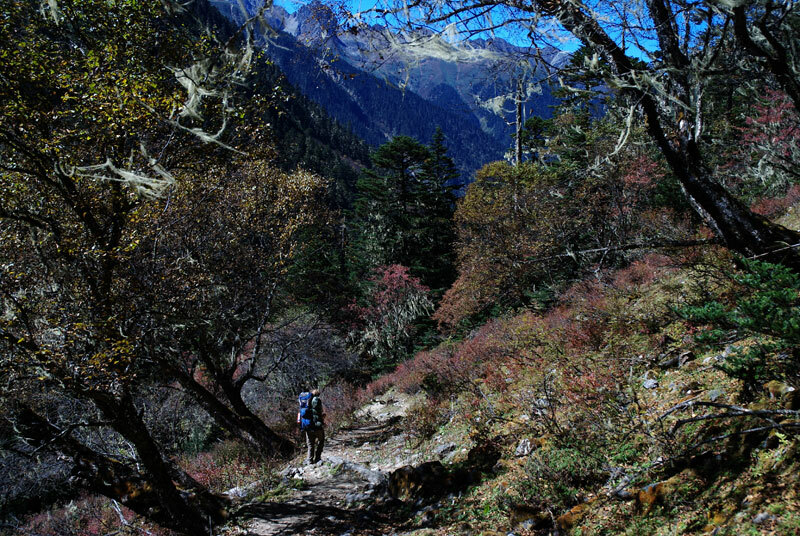 The Meili Xue Shan region is a hotspot in biodiversity. 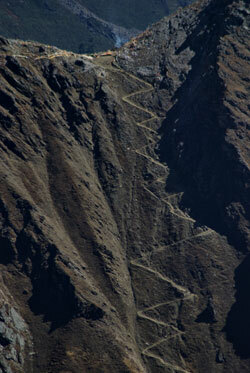 However, high passes can be snow covered until July, and the trail in spring is more eroded and slippery. Monsoon time begins, so be prepared for some rain. 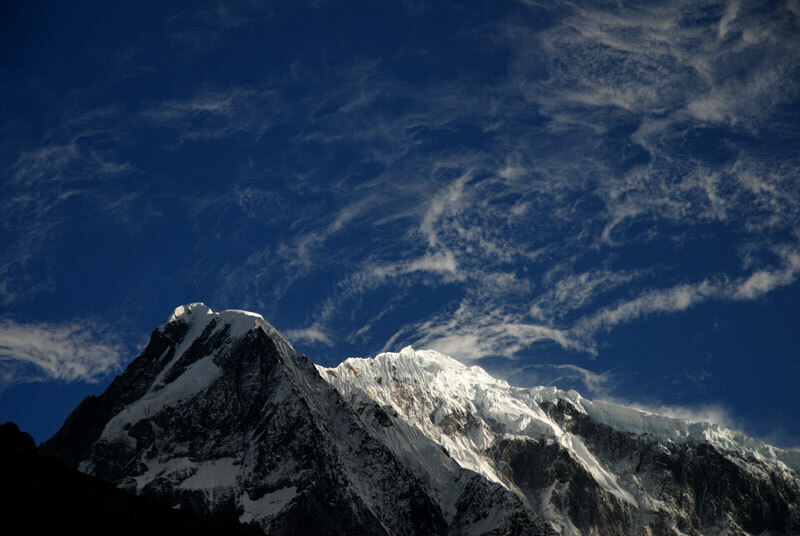 Mountain peaks are often covered in clouds. 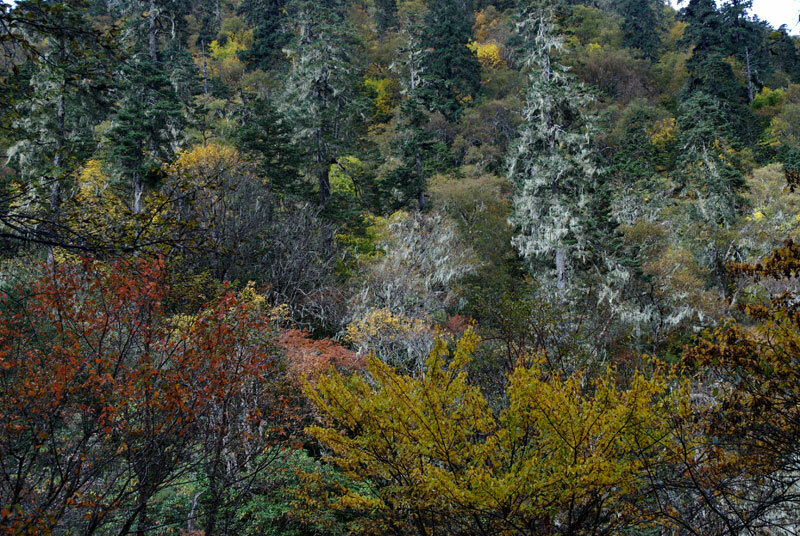 In autumn one the deciduous forests are very colorful and the probability to see the summits of the high mountain giants is rather high. However, temperatures can be very hot in the deep valleys and on some stages it can be hard to find water in the dry autumn. Many pilgrims hike in autumn, so it can be rather "full". Copyright © 2009 Waltraud Schulze & Andy Heßberg.